@nickvanderlinde Emerce Dare (Also: OMG will robots take over my job? ! ) How can we use AI to design and build better digital products? @nickvanderlinde Emerce Dare What is this thing? @nickvanderlinde Emerce Dare We believe the future is about less interactivity, not more. INSIGHT @nickvanderlinde Emerce Dare Context-awareness allows us to design much smarter, more relevant user experiences. INSIGHT @nickvanderlinde Emerce Dare Artificial intelligence allows us to fundamentally reimagine today’s screen-based interactions. @nickvanderlinde Emerce Dare We are not limited by technology. We are limited by our imagination. @nickvanderlinde Emerce Dare Natural language interfaces will radically change how we interact with technology. @nickvanderlinde Emerce Dare How will this change our work? @nickvanderlinde Emerce Dare Wait, I’m a creative! @nickvanderlinde Emerce Dare How do we stay relevant? @nickvanderlinde Emerce Dare So… what did the designer on this project do? INSIGHT @nickvanderlinde Emerce Dare Design helps to connect the dots, bridging the gap between people and new technology. @nickvanderlinde Emerce Dare Artificial intelligence is about content and design as much as it is about engineering. INSIGHT @nickvanderlinde Emerce Dare AI requires intense collaboration between content specialists, designers and technologists. INSIGHT @nickvanderlinde Emerce Dare As stuff increasingly happens “under the hood”, building in affordance will go a long way toward preventing disaster. 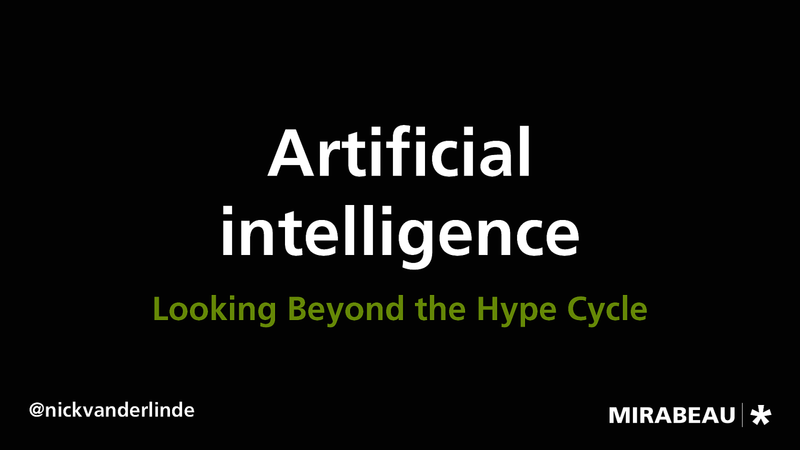 View Artificial Intelligence – Looking Beyond the Hype Cycle on Notist. With the arrival of self-driving cars, hyper-intelligent chat bots and the internet of things, the age of artificial intelligence is finally here. And this raises interesting questions: what is the role of user experience design in a world where algorithms increasingly make decisions. Will there by anything left to design? This talk explores the impact of AI on the field of user experience design, and elaborates on why the relevancy of design as a discipline will increase as artificial intelligence matures.